Fleetwood Town’s on-loan Rangers man Jason Holt has set his sights on becoming Town’s go-to dead ball specialist. It is no secret Town struggled both offensively and defensively on set-pieces in last term’s 14th-placed League One finish. It has been one of the elements new boss Joey Barton has looked to address early on his reign. 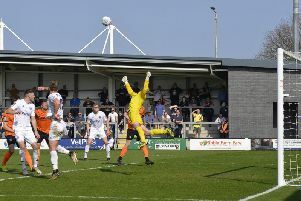 It has been so far, so good with Town just conceding two goals in their opening three games of pre-season with Holt assisting both Paddy Madden and Tommy Spurr in scoring from corners. Town have also scored directly from a free-kick through Joe Maguire, Craig Morgan netted from a Harrison Holgate dead ball, while Ged Garner has scored from the spot. Corner duty is something with which Holt has really been tasked previously, but something the former Sheffield United player is relishing. He said: “I’ve got the job to go on the corners and I’m happy to do that; I’m happy to assist my team-mates for goals. “I’ve actually not really taken set-pieces at my other clubs so I got asked to do it at Salford. Holt is one of five new boys at Highbury along with Morgan, Tommy Spurr, Lewie Coyle and Eddie Clarke. Currently on tour in Hungary, Town have embarked on a number of team bonding exercises during this week abroad as well as maintaining their winning start with a 4-1 win over STK Fluinese Samarin on Tuesday. Holt said: “First things first, good to get that winning habit going. “We have taken that into our trip to Hungary. “These trips are key, especially when you have got quite a few new signings. “It helps the squad bond, everyone gets to get together and it will be a worthwhile trip. “We were back in early doors and I think that has shown because the lads look fit. For Holt one of the key things this pre-season is building relationships and understanding with his new team-mates. Thus far, Barton looks to be favouring a 4-3-3 system with Holt teaming up alongside players including Kyle Dempsey and Harrison Biggins. The midfielder says that possession is something that Barton wants him and his fellow midfielders to focus on this term. He said: “It has been good when you come in; as a new player you need to force and make the relationships on the park work. “That is something that have started working on on the past two games and we will continue to work on in the rest of the pre-season friendlies.